On his family's north Cornwall farm, Robert Hooper regularly ventures on to steep ground where most people find it hard to keep their footing and stand upright. Yet he drives a tractor backwards and forwards across the dramatic slopes, spraying weeds and spreading fertiliser to keep the grass productive for grazing sheep and cattle. 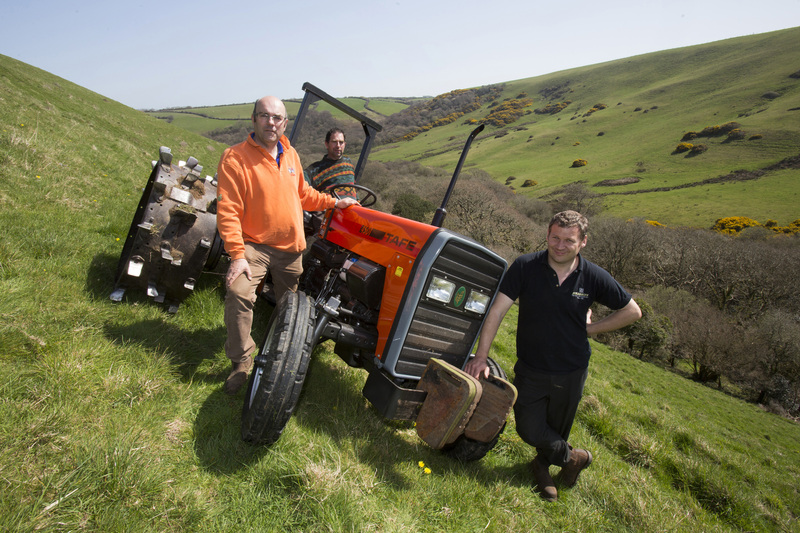 He's been doing it for the past 25 years without mishap - as did his father, Roy, before him - on 50 acres of the steepest ground on the farm near Bude. "If we didn't manage it, this ground would become unproductive and return to gorse," Mr Hooper said. "If you treat it with respect and just go at a steady walking pace, the hill will look after you; but if you think you can tear about, you'll quickly end up at the bottom!" The secret to his new tractor's grip on the slope is a set of steel spade lug wheels of the type used on early tractors before tyres where good enough to provide decent traction for ploughing and the like. In fact, there are two sets of the deep-lugged wheels welded together to provide the grip and spaced at the widest track setting to keep the tractor from tipping over. They are fitted to a Tafe 45DI tractor - supplied by Dorset-based importer Tractors UK through local dealer Hamblys - that replaced a venerable MF240 that was no longer up to the job. 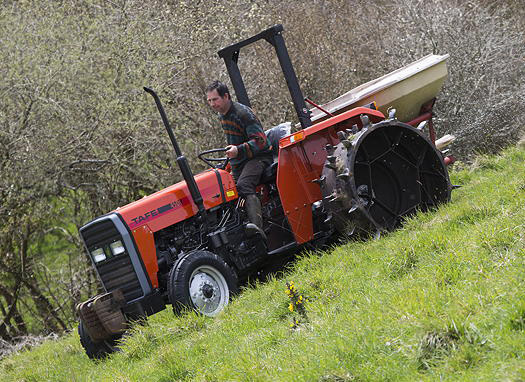 The Tafe 45D has been fitted with wide-set steel spade lug wheels to make it hill-friendly. Dry drum brakes have also been used as wet brakes wouldn't be effective on the extreme slopes. The Tafe is built in India by Tractors & Farm Equipment, one of the world's biggest agricultural machinery manufacturers, as a modern iteration of the MF240 and the MF135 that preceded it. 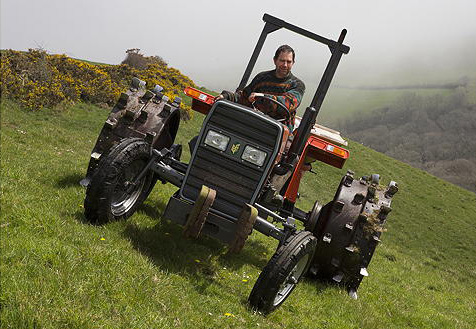 "Our machines are very popular as scraper tractors on dairy farms and as general purpose power units for groundscare, horticulture and smallholdings," Martin Richards of Tractors UK said. "They're simple, reliable and durable, often clocking up thousands of hours; in fact, we know of some with more than 10,000 hours - they're a lot better value than buying a cheap second-hand tractor." The Tafe 45DI has a 47hp direct injection diesel engine and a gearbox with eight forward and two reverse gears. It normally comes with low-maintenance, oil-immersed brakes for durability but Robert Hooper's example was specially built with dry drum brakes on the end of the rear axle. "Oil in an axle with wet brakes would drain to the lower side leaving the upper brakes without lubrication," explains Robert Hooper. "That would be no good because I'm using them all the time to stop the front end from turning down the hill - the steering wheel is just something to hang on to!" Four-wheel drive would help - it's available on Tafe tractors - but was unsuitable for this application because the diameter of the spade lug wheels versus the normal 13.6R28 tyres woud have affected the rolling circumference ratio between the front and rear tyres, leading to possible transmission damage. With the conventional rear wheels in place, the Tafe tractor will be handling a number of regular jobs that include hay turning, static bale wrapping and yard scraping at Pengold Farm, which is at the heart of a 750-acre farming operation begun by Robert Hooper's grandfather, Albert. Today, the business runs 150 suckler cows to raise cattle as stores, 65 British Friesian dairy cows and a flock of sheep. The young cattle are turned out on to the steep land at 12-months old, with the sheep following to graze down the permanent pasture. The sheep and cattle are sure-footed on the 45-50-degree slopes, and with its spade lugs penetrating several inches into the surface, so is the new Tafe tractor that helps maintain the grass they feed on.